In December 2013 (has it been that long!?) 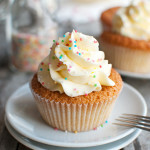 I organized a blind taste test, in which some of my old high school teachers – these days better known as the Rocking Rebel’s colleagues – tested the six different kinds of buttercream known to men: American buttercream, flour buttercream, French buttercream, German buttercream, Italian buttercream and Swiss buttercream. I was particularly interested in the flour buttercream, which I had heard the Pioneer Woman rave about, but I’d be lying if I told you I didn’t enjoy tasting all of them! Anyway, I called the test ‘The Battle of the Buttercreams’ and to this day, it’s been the most popular series on the blog! 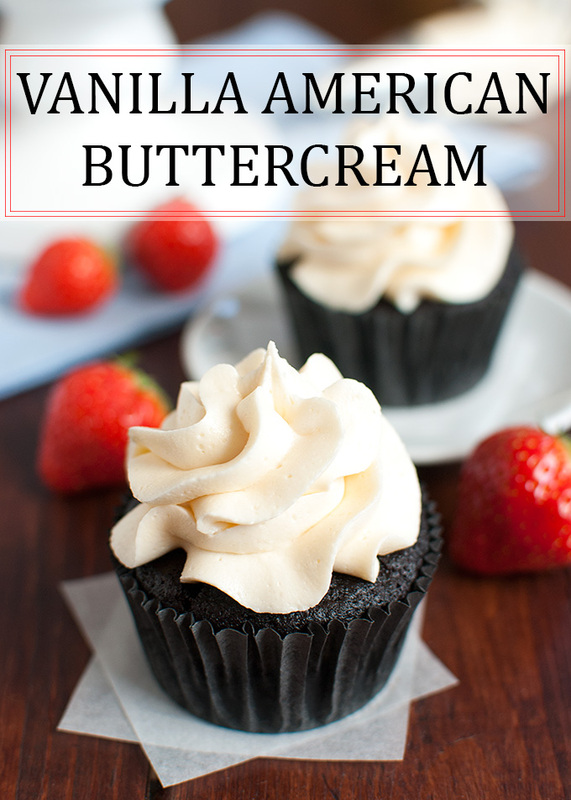 However, since I first posted the series I’ve learned sooo much more about buttercream! For example, I figured out the best way to incorporate ingredients, I’ve learned about the ‘dangers’ that come with making a water-in-fat emulsion and I’ve updated my recipes. So, last January, I decided to update my buttercream series. Enter Battle of the Buttercreams 2.0! But moving on. This post is about American buttercream. Like last time, I thought I’d post about the different kinds of buttercream in alphabetical order. I also thought the buttercream was just way too sweet. Now, I have to say, American buttercream, no matter how you make it, will always be on the sweet side, simply because it’s a mixture of powdered sugar and butter. However, since 2013, I’ve come across a few little tricks to make the sweetness a little less overpowering. 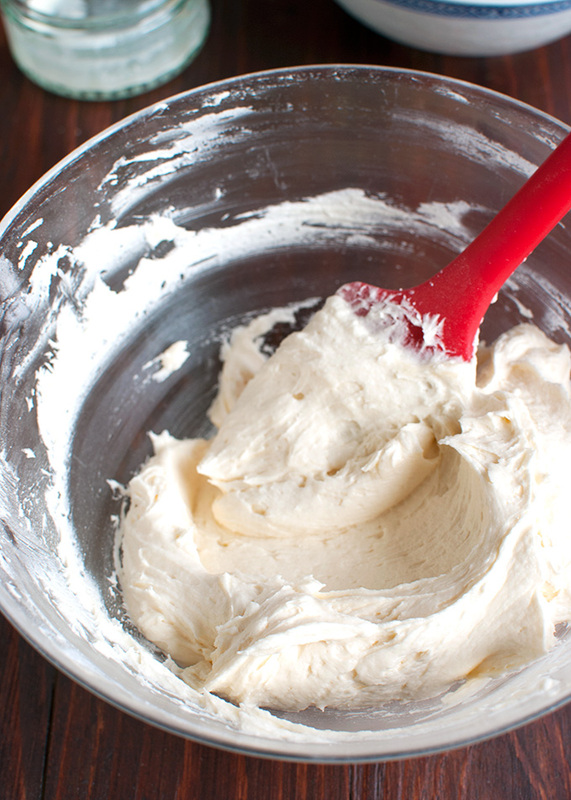 This new recipe for American buttercream is also a lot lighter than the 2013 version. I’ve completely changed the preparation method and ingredient ratios and the result is a creamy, smooth, fluffy buttercream with a delicious, balanced flavor. Because of the new preparation method – the Beaten Butter Method! – the powdered sugar completely dissolves into the buttercream. Oh, and a few secret ingredients mellow out the sweetness of the buttercream and brighten up the flavor! So yeah, I’m proud to present to you: the perfect American Buttercream! Let’s first take a look at the ingredients, shall we? To make my American buttercream, you will need unsalted butter, powdered sugar, heavy whipping cream and vanilla extract. If American buttercream is usually too sweet for your taste, you will also need fine table salt and a few drops of lemon juice. Those are the secret – well, not-s0-secret-anymore, I guess – ingredients that make my American buttercream so ridiculously delicious! Since 2013, I’ve experimented with the amounts of butter, powdered sugar, cream and vanilla in this recipe. Although I use pretty much the same butter to powdered sugar ratio, I increased the amount of cream and added more vanilla. The extra cream not only makes the buttercream, well, creamier, it also ensures that the powdered sugar dissolves more willingly and that the resulting buttercream is smoother! The extra vanilla obviously makes the buttercream a bit more vanilla-y. By the way, about the butter, you want to soften it at room temperature. I usually cube cold butter, arrange the butter cubes on a plate like little soldiers, and allow them to come to room temperature in about 30 minutes. If you leave the butter out for too long, the buttercream may be a bit looser. This isn’t really a problem, flavor or texture wise, but it may affect how well the buttercream pipes. About the powdered sugar, as I mentioned in my last American buttercream post, most brands of powdered sugar contain an anti-caking agent. Back in 2013, I thought that this anti-caking agent was the reason why the buttercream turned out grainy, because I thought it prevented the powdered sugar from melting completely. However, I now know that the texture of the buttercream depends on the preparation method. So don’t be afraid to use powdered sugar that has an anti-caking agent in it, because I do too and now that I’ve changed the preparation method for my recipe my buttercream comes out luscious and creamy every single time! Oh, and I take it any self-respecting home baker already knows not to use the artificial vanilla flavorings? Because they’re just not as good as the real thing! 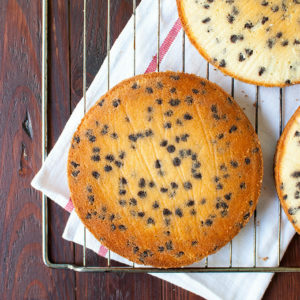 If you can’t get your hands on real vanilla extract, take a vanilla pod, split it lengthwise with a sharp knife, scrape out the seeds and add the seeds to the buttercream. It tastes soooo much better! So now that we’ve discussed the ingredients, let’s talk about the preparation method! Anyway, see how fluffy that butter is? That’s how you want it to be before you add the rest of the ingredients: the powdered sugar, cream and vanilla (photo number 3). If you already know you want to make the buttercream a little less sweet, you can add the salt too at this point, although you can also add it later, once the buttercream has come together and you’re able to taste it. 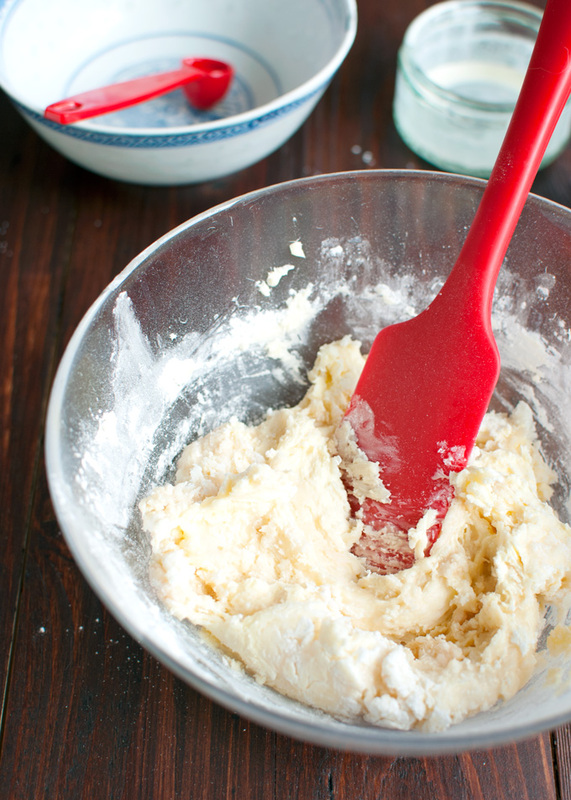 Once you’ve added the ingredients, smush them all together using a rubber spatula or a spoon (as shown in photo 4). Now, you don’t really have to do this, it’s totally optional, and if you like all your kitchen surfaces sticky with powdered sugar, by all means start mixing at this point. But if you’re like me and prefer your kitchen to be clean, smush, smush, smush your little heart out! Just keep in mind that this recipe makes only about one and a half cups of buttercream. I know some stand mixers work better with larger quantities of ingredients, so if you have a large stand mixer, consider doubling the recipe. 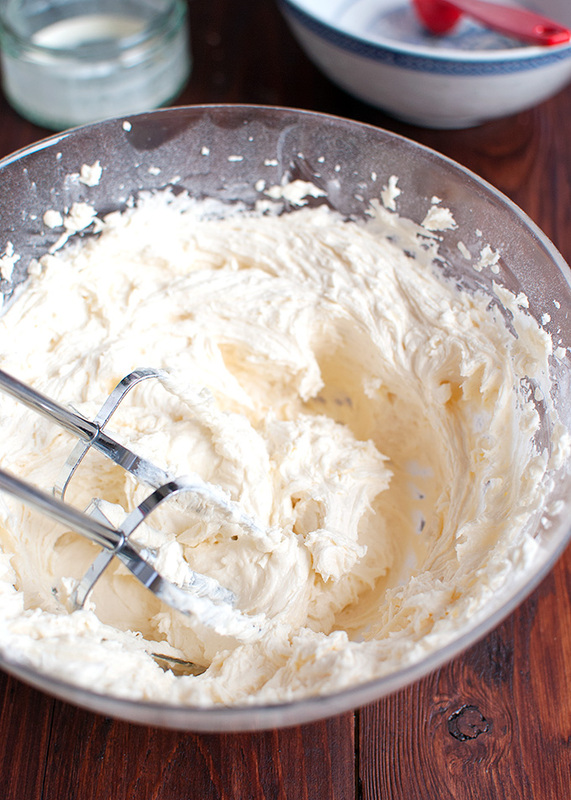 Anyway, mix for 3-5 minutes, or until the buttercream has become gorgeously fluffy, almost white and super smooth. Once the buttercream has come together beautifully, it’s time to taste. Super important! If you think the buttercream is too sweet, sprinkle a pinch of fine table salt over the surface of the buttercream, mix briefly to incorporate, then taste again. Add more salt if you think it needs it. The salt cuts through the sweetness and gives the buttercream a more complex flavor. If you’re familiar with the deliciousness of salted caramel you’ll know exactly what I’m talking about! By the way, don’t be afraid of adding too much salt. Remember, you’re only adding a pinch at a time. I usually add about three large pinches, or maybe 1/4 teaspoon, before I’m happy with the flavor. And then I add something else, too! Have you ever noticed that American buttercream can taste a bit heavy, despite a fluffy, gorgeously light texture? Almost cloying, even… Which is exactly why I tried to brighten up the flavor a bit with… lemon juice. And no, not a lot of lemon juice. This is vanilla buttercream, not lemon buttercream. But still, don’t you think a touch of acidity would considerably brighten the flavor of somewhat boringly sweet buttercream, making it even better? It sure does! So after adding the salt, I always add a few drops (and when I say a few drops, I really do mean a few drops) of lemon juice. It’s the best! Because you use so little lemon juice, the buttercream won’t taste lemony. Instead, the flavors seem to open up or something. So if you think the buttercream is missing something, make sure to add those few drops of lemon! Once you’re happy with the flavor, grab your rubber spatula again and smush the buttercream against the sides of the bowl to get rid of any larger air bubbles (photo above). This makes piping nice designs that much easier. I think that’s probably why some bakers prefer to make buttercream using the flat beater of a stand mixer: less large air bubbles. However, you can get the same smooth results by smushing for a minute with a rubber spatula. Much cheaper, right? Just smush, smush, smush and you’re done! 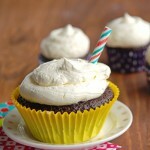 My recipe makes about one and a half cups of buttercream. 375mls to be exact, which is enough to generously frost 6-8 cupcakes. By the way, this buttercream pairs exceptionally well with those amazing and easy dark chocolate cupcakes I posted about last week. * based on nutritional information. So what do I have to add? Not much, except that this recipe has completely changed the way I feel about American-style buttercreams. Remember how I liked the American buttercream the least of all the buttercreams in the original Battle of the Buttercreams series? Well, I absolute love this new recipe! So enjoy guys! 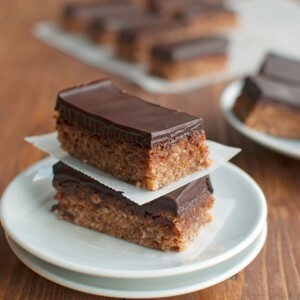 And stay tuned for a delicious chocolate version of this recipe! 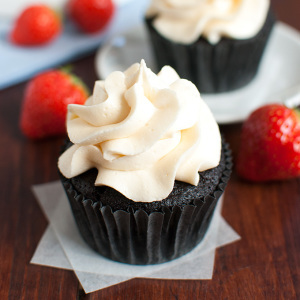 Yields 360g of buttercream, or 1½ cup + 1 tablespoon, enough to generously frost 6-8 cupcakes. In a medium-sized bowl, using a mixer fitted with either a flat beater or a whisk attachment, beat the softened butter until fluffy and creamy, about 2 minutes. Add the powdered sugar, cream and vanilla. 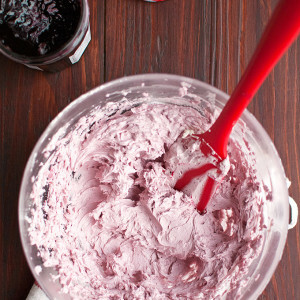 Using a rubber spatula or a spoon, smush all the ingredients together until incorporated, then mix with a mixer until smooth, fluffy and creamy, and the buttercream has lightened in color, about 3-5 minutes. Taste the buttercream to see if it needs any salt. If the buttercream is too sweet for your taste, sprinkle a pinch of salt over the surface of the buttercream. Mix briefly to incorporate, then taste again. Add more salt, a pinch at a time, if the buttercream is still too sweet for your taste. Once you're happy with the sweetness, add a few drops of lemon juice (optional) to brighten the flavor. Mix well to incorporate. 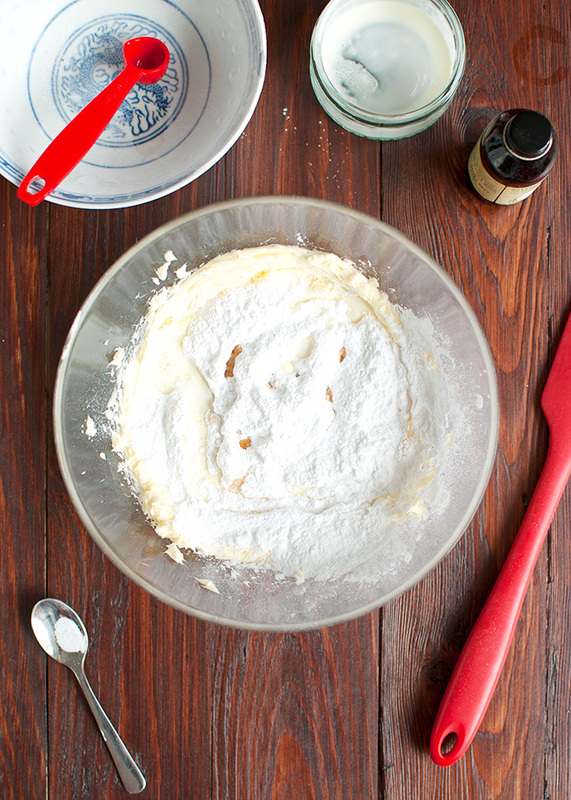 Finally, use a rubber spatula to smush the buttercream against the sides of the bowl to get rid of any large air bubbles. This makes piping the buttercream a lot easier. Use immediately or store, covered in the fridge, for up to seven days. 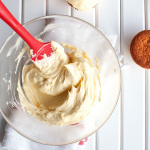 Before you want to use it, allow buttercream to come to room temperature and mix briefly until smooth and creamy again. 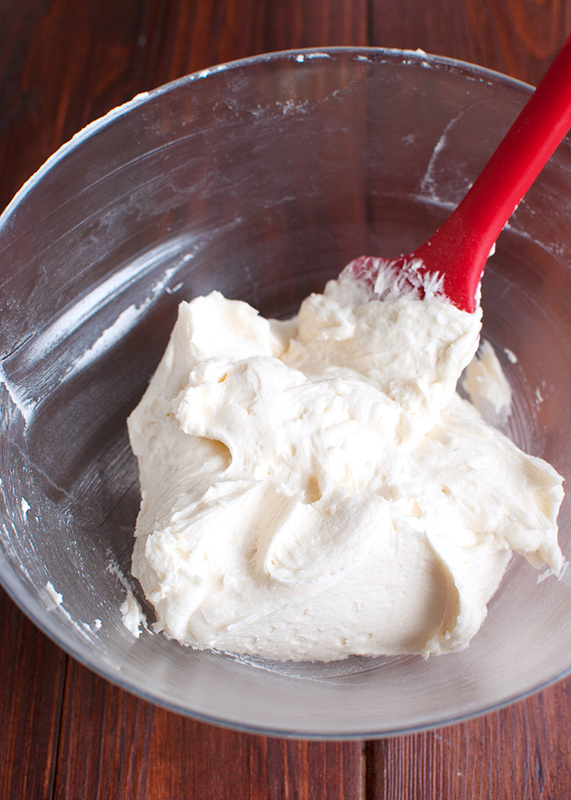 Buttercream can also be frozen in a zip-lock bag for up to two months. Allow to thaw in the fridge overnight, then allow to come to room temperature and mix until smooth and fluffy before use. Frosted cakes or cupcakes stay fresh, covered at room temperature, for up to three days. * I usually take the butter out of the fridge 30 minutes before I want to start mixing. Hi! I just found your site and am SUPER excited!! I LOVE baking and am always looking to try the next best recipe, anywho! I was wondering, if you use salt in your buttercream, why not just use salted butter? Thanks! Btw I could only get 4 stars to fill up, I wanted to rate it 5! Hi, I just made this to frost a cake. The flavor was not very good at all. It tasted like butter. I had to add a lot more powdered sugar to improve the taste. And then, because of the quantity of powdered sugar, the frosting hardened and formed a shell when it was left for a little while. I still used it, but I think it could have been better. Hi Lilac, I’m sorry you didn’t like the recipe. 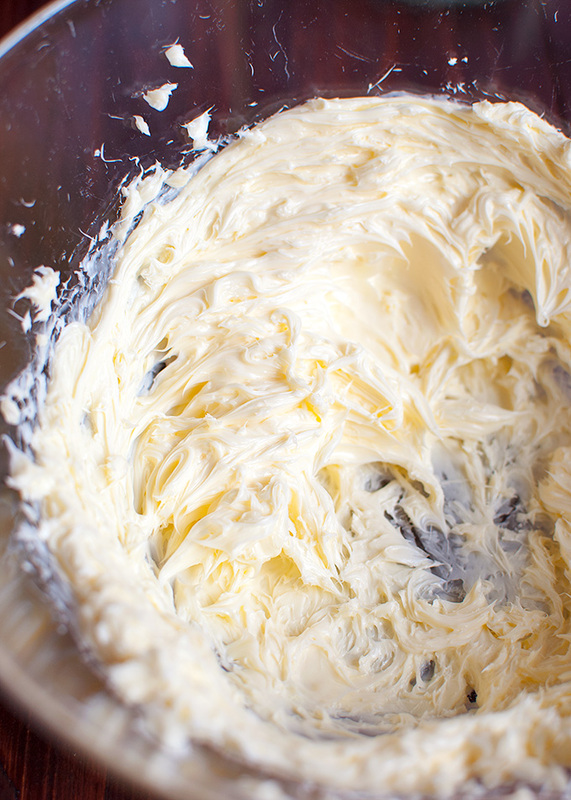 Have you tried making American buttercream before? Because this buttercream definitely is not for everyone. Because it’s just a combination of sugar and butter, the buttercream can be either too sweet or too buttery for some palettes! Maybe you simply prefer a lighter buttercream, like the flour buttercream? By adding more powdered sugar, or when you don’t beat the butter long enough, the buttercream may indeed form a shell when you leave it out for a while. For that reason, I always beat the hell out of the butter to make it light and super pale (this takes at least 5 minutes in a stand mixer on high speed) and use only 220g powdered sugar. This way, the flavor of the butter is not overpowering, the buttercream won’t be too sweet, and it won’t form a crust. Thanks for the detailed tips and tricks. 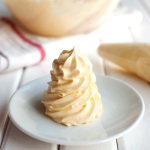 I have been looking for a way to make American buttercream less grainy and I can’t wait to try it! Hello may I know if american buttercream is supposed to have a texture like “sandy” and kind of grainy? I always try to make it fluffy but it’s the same. is it supposed to be like that? Hi Hani, American buttercream can indeed come out a bit grainy. I find that it really helps if you beat the butter really well before adding the other ingredients. Also, adding a splash of cream ensures that the powdered sugar dissolves properly into the buttercream. Have you tried my recipe? It always comes out super smooth!